On Christmas Eve I will deliver, for the twelfth year in a row, an iced, naively decorated fruitcake to my oldest and dearest Australian friend, Enid. I will pull up into the driveway of her brick home, set post-war style beside a neat, suburban stretch of lawn. She will open the front door before I have even knocked, and before she’s even kissed me hello will tell me how beautiful the cake is and how she couldn’t possibly cut into it. She will take the cake in her delicate hands, walk over to the ornate wooden dresser near the window with the venetian blinds and the view of the leafy street on which I, too, once lived, and will place my offering on a crystal cake stand; and then she will ask me to take a photograph of it. Enid has tried to sway me from this ritual in of late – 'You’re not to make me a cake this year, you have too many other things on your plate!' – but I will not be deterred, for this is not merely a Christmas gift or a sweet treat designed to heighten the season’s celebratory mood. No, this is an object that contains within it the story of a friendship between two women almost forty years apart in age; folded into it is all the joy and delight and love she’s given me over the years, and which am now returning to her. I met Enid 13 years ago when we rented the house next door to hers. We had recently arrived in Australia, an immigrant family moving hazily through each day, rabbits frozen in the headlights. She was at our back door in an instant, offering in her unobtrusive way information about milk delivery and rubbish pick-ups, recommending dentists and doctors, insisting we use her tumble drier during a spell of seemingly endless rain. With no children of her own, she happily tolerated – welcomed! - my own three as they romped across the fenceless boundary and into her garden, used her front lawn as an extension of their cricket pitch, and hid out behind her garage during games of cops and robbers. She would make plates of egg sandwiches and serve them with bottles of icy ginger beer to the crowds of children dangling from the tree in our front yard. But our children’s merriment concealed a deep familial unease: despite our qualifications and experience, neither my husband nor I could secure employment. The months rolled on as rejection letters streamed in and our savings dwindled. Interviews led to shortlistings, hopes were raised and then dashed with inevitable refusal. Offers came in from the Western Australian Goldfields, and we prepared with heavy hearts to leave. Then, suddenly, our fortunes changed: after six months I was offered a job as a features editor; after eight months my husband was employed as an engineer. We scrapped plans to move interstate and Enid came round with a bottle of celebratory champagne. That Christmas, having weathered our first year in a foreign country - enduring unemployment and rejection, homesickness and the profound heartache that accompanies it - I made Enid her first Christmas cake. The fruit had been steeped in too much brandy and the cake stuffed indulgently with nuts and glace cherries, the way I like it. It was covered in marzipan and home-made royal icing, and decorated by my young daughters with edible sprigs of holly. She must have known when we delivered it to her front door that it was a triumph of sorts: our first Christmas in Australia, and for this occasion a gift for my very first Australian friend. This year’s cake will be the twelfth. In the years that have passed our friendship has deepened into something that is comforting and familiar and bears its own history. When we became Australian citizens Enid presented us with a bunch of waratahs – the flower for our home state, NSW. Over the years she’s shown in me the same pride my own, late, mother would have done, and has watched with love and admiration as my children – who she remembers first meeting as cherubs with 'haloes of golden hair' – have grown into teenagers and young adults. Enid continues to serve them the plates of egg sandwiches they love, even though we long ago moved from the little house neighbouring hers, the one she still refers to as ours. She often tells me I was robbed when I failed to win best fruitcake at the Royal Easter Show - a competition I finally entered at her insistence. It doesn’t matter: as far as she’s concerned, she says, my cake is always best. Christmas cake image by Shutterstock. Lovely story, Catherine.My neighbour of 18 years, who lived directly opposite our house, died in August. Unlike myself, she was a talented cook. Every month she cooked delicious cakes for the Baptist church stall at our monthly market. I would try to be at the market early so I could buy one of her cakes. I miss her very much and realise how fortunate I am to have been her neighbour. Lovely story, Catherine: a nice contrast to the other story today. People are good. What a delightful Christmas cake story. I can almost smell the brandy drenched fruit. But more than that, it is a story of immigration, neighbourhood friendship and ageing, somehting we should all be aware of in this festive season. Lovely story. I also make christmas cakes every year and give them out to people. My family was poor living in rural Canada, but my mother always made a beautiful very dark christmas cake that I loved. Mine never look quite the same, but they are reminiscent. Thank you for this lovely reminder of common and natural kindness, Catherine. These situations foster warm friendships and bring out the innate goodness in us all. We need more of these stories. Thank you, Catherine for sharing your story. It is encouraging to hear of people coming to a new country and being welcomed and later being blessed with good jobsand pleasant livibg conditions. I'm sure that you' like so many of us' wish this could be true for all those who come to our shores, hoping for freedom and a better life, had ths same experience. Beautiful article Catherine. It truly warmed my heart. Thank you. I just read your lovely story Catherine. 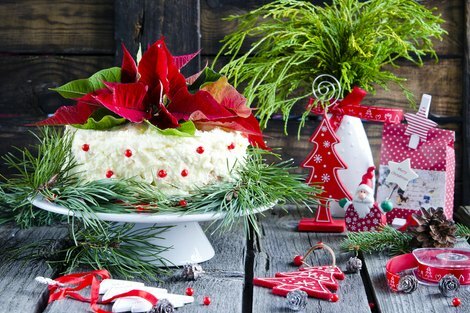 A beautiful Christmas story of love, friendship, giving and of course, the mouth watering Christmas cake. It took my mind back many years to my mother's annual making of the Christmas cake, which was an event in our family. At the risk of sounding soppy, it doesn't matter that you didn't win at the Royal Easter Show. Your cake wins where it is more important.